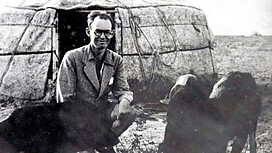 Gareth Huw Davies - From a small town in Wales - "the man who knew too much"
Gareth Jones, scoop gathering journalist murdered in China in 1935. For its size, the small town of Barry in South Wales, population 47,863, produced a notable number of high achievers. They start with the Victorian industrialist and philanthropist David Davies, whose daughters Gwendoline and Margaret donated their important fine art collection, including many famous impressionist paintings, to the National Museum of Wales in nearby Cardiff. The list contains one of the great names in Welsh Nationalists politics, Dr Gwynfor Evans, and the Australian politician (the family moved there when she was five) Julia Gillard. Damien Green is a minister in current Coalition government (2013). The other, journalist Gareth Jones, who died 78 years ago today, on 11th August 1935, remains little-known by the wider public, despite making his name in the 1930s with a series of remarkable scoops which included disclosing Stalin’s state-sponsored famine in the Ukraine, and being one of the first foreign correspondents to join Hitler on the campaign trail, in 1933. In terms of the personal bravery he showed in following his career, Jones stands apart from Barry’s other famous names, although courage is certainly a quality that can be assigned to Julia Gillard for the way she acquitted herself in the bear pit environment of Australian politics. Then we have Jones, a real life adventurer journalist who demonstrated similar virtues in his own career, with painstaking on the ground research. His own safety was under very clear threat, as he asked the difficult questions on behalf of a world drifting towards war. He paid the ultimate price for his diligent reporting when he was murdered one day short of his 30th birthday in 1935. And yet the life of this unlikely hero – the photographs giving a misleading impression of the teetotal and academic Jones as prim and staid – paradoxically has been ignored by the filmmakers. Even now online biographies of Jones refer to him being “murdered by bandits” (Wikipedia), and it’s a conclusion I have repeated myself. However the conspiracy theory, that he was eliminated either by the Russians or the Japanese security services through their hired killers, was circulating within months of his death, as you can see for yourself here online. Did he discover the evidence, too uncomfortable for the Japanese and perhaps their German allies, that the Japanese were planning a military coup. His mentor, former prime minister David Lloyd George, pressed for an enquiry, but even then was it being closed down by people who had the truth? Lloyd George suggested Jones died because he knew too much.